Sri Deyva Nayaga Perumal Temple is located in Cuddalore , TamilNadu. This Hindu Temple is dedicated to Lord Vishnu. This Holy Temple is one among 108 Divya Desam. Aadhisheshan worshipped Sriman Narayanan in this sthalam. Aadhiseshan brought both the Viraja Theertham (Garuda Nadhi) and Ganga Nadhi together and dedicated those two rivers towards the divine feet of Sriman Narayanan. Once Vedantha Desikar wanted to see Sriman Narayanan and started doing Tapas and the Perumal came in front of him. He did the Tapas in this Aushadhagiri Mountain only. Sriman Narayanan fully satisfied on his Tapas, showed his seva as "Lord Hayagreevar" along with Garudalwar. On the top of the mountain, a separate sannadhi for Sri Yoga Hayagreevar is found. 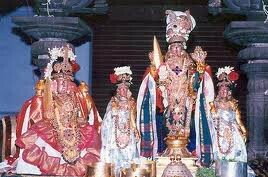 Sri Vedantha Desikar lived for almost 40 years in this sthalam and we can see the Thirumaaligai he lived. Separate utsavams in September - October for Sri Vedantha Desikar is done in a very grand manner. Generally, the milk for snakes will be poured into Putru (very small place made of mud where snakes are found), but instead here in this sthalam, the milk is poured into a well inside the Koil Pragharam. The well is called as "Sesha Theertham". With this Sesha Theertham, the neivedhyam (food) or Prasadham is done for the Perumal and with the Garuda Theertham, the Thirumanjanam (divine bath given to the Perumal) is done. In Thai and Aadi month, in this sthalam, the milk is not poured into putru (ant hill) instead it is poured into the Well (Sesha theertham), which is found inside the temple.Vaanama malai, which is one of the Divyadesam in Pandiya Naadu has all the characters of curing all and any kind of diseases. With the oil, which is found in the well, all the diseases are cured and the Perumal there is Deva Nayaga perumal. 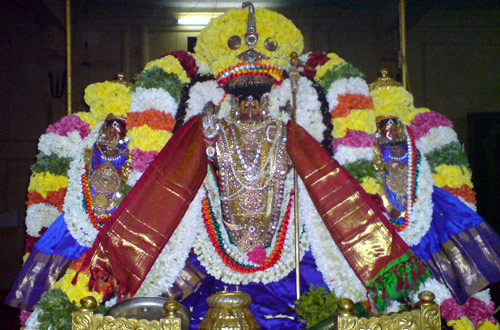 Since Aheendiran (Ananda Azhvaan Aadiseshan) worshipped the Perumal here, this place is called as "Aheendirapuram"
This Divyadesam is one of the main sthalam in Nadu Naattu Divyadesam. 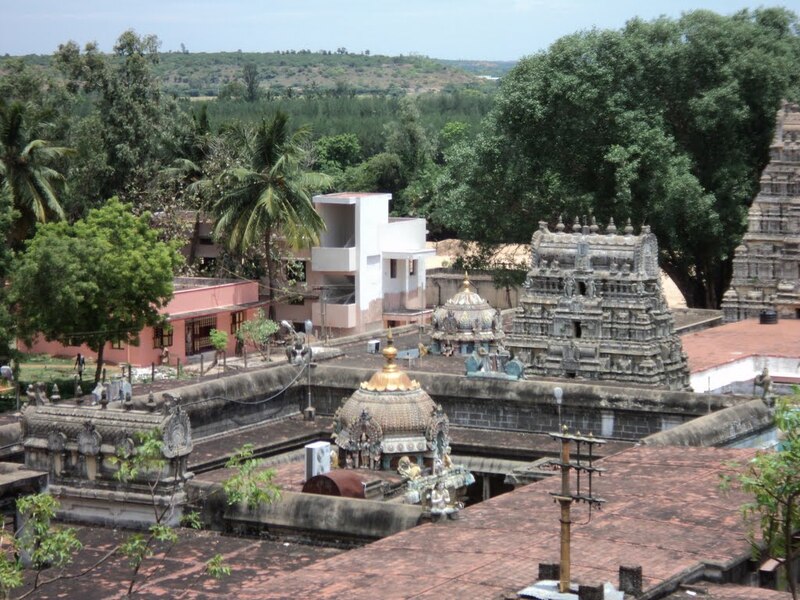 The temple is situated about 5 Kms away from Cuddalore in South Arcot District, Tamil Nadu. This temple is located underneath a small mountain (Malai Adivaram). 3 miles away from Tirupathirippuliyoor railway station which is in between Chennai - Trichy railway lane. Bus facility is also available. Near to the temple, Aushadhagiri, a medicinal mountain is seen. It is said that during Ramayana time, when Hanuman took Sanjeevi Malai, a small part of it was dropped on the land and that small part is said to be this Aushadhagiri mountain, which is said to be full of medicinal herbs are found. The Perumal in this sthalam is Deva Nayaga Perumal with the Lotus in the inner palm of his right hand, and in the fore head, he has the Eye along with Jada mudi and Changu and Chakram on his hands. This is one of the seva which tells us all the Gods are the same because, Lotus which is found with Lord Brahma, and Nettrikkan (ey on the fore head) and Jada Mudi which is found with Lord Shiva and Sangu and Chakram which is found with Shri Vishnu. This shows there should be no fights between Vaishnavam and Saivam and both are similar one. To explain this, he gives sevas as like this in this sthalam. Do respect religious sentiments at Temple.Do deposit your offerings in the hundi only. Thiru Naagai - Sri Neelamega Peruma..
Thiru Naagai - Sri Neelamega Perumal Temple,Nagapa..